1930s beauty report by Rosalind Shaffer. How often does one hear that expression to describe a close race? Then there’s the story about the horse that stuck out his tongue and won the race. Modify this a little and you have a true story. The girls of Hollywood tip-tilt a perky nose, languidly lift the upper lip a trifle, and they win the race too – the race for beauty. The saucy tip-tilted nose was much preferred in the days before Anita Loos let loose her propaganda about gentlemen preferring blondes. Anyone can be a blonde: but a nose is different. 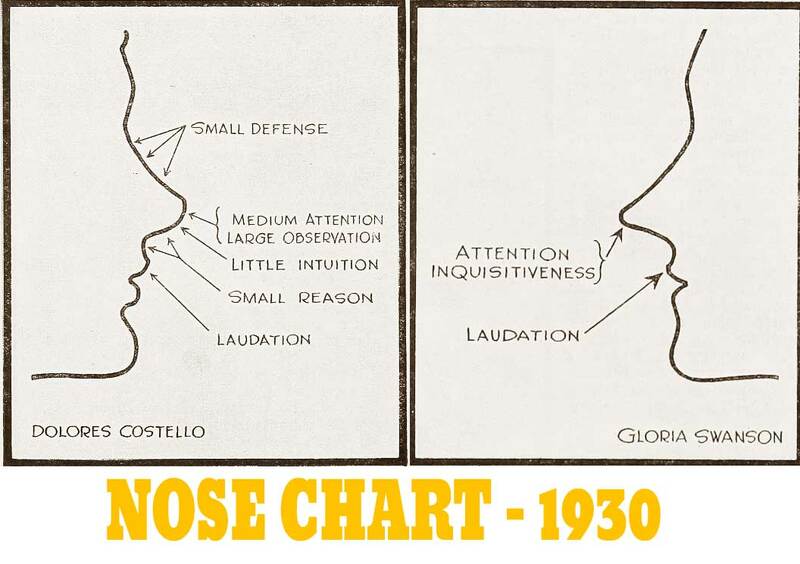 The 1920s ideal Hollywood nose in vogue was the retroussé ( concave ) nose and the short upper lip. no actress lacking these two vital characteristics was even considered for the screen. 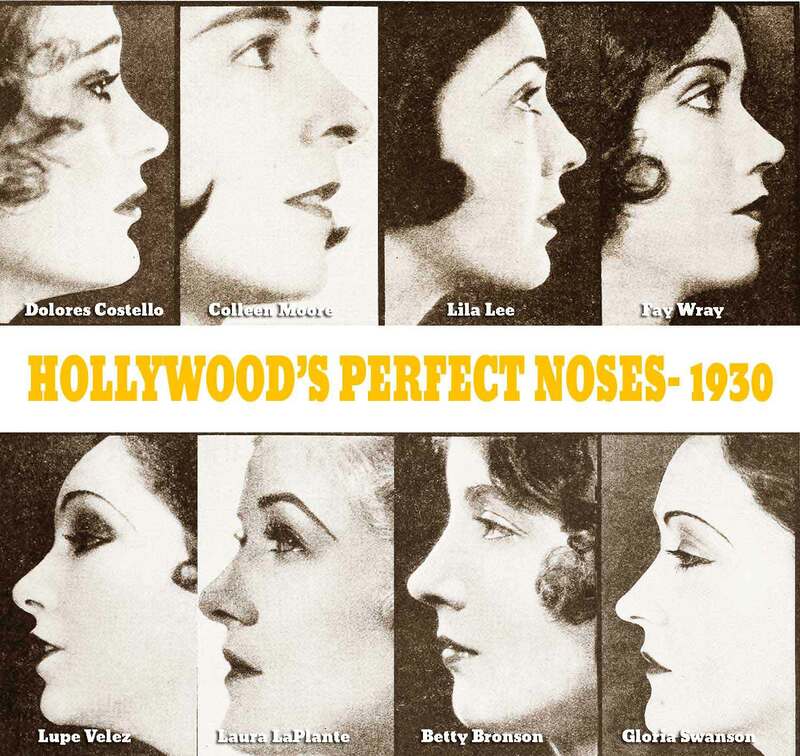 Now while there are many actresses in 1930 who do not possess a retrousse nose, it is really astonishing to see the number who do ! A list of thirty names, drawn from the actresses of prominence in Hollywood, shows retroussé noses, many with the short upper lip. However possessing a turned up nose does not necessarily guarantee beauty, and many stars like Colleen Moore, Betty Compson and Mae Murray refuse to be photographed in profile. Among these are Gloria Swanson, Lillian Gish, Ruth Chatterton and Dolores Costello, the four most distinguished retroussés of pictures. None can deny their beauty and talent. Just what is a retroussé nose? A true retroussé nose is one which has a concave outline from its tip to its base between the eyes. It may be very concave or just slightly, its tip may be blunt or pointed. Looking at it from the front, it may be wide all down the face, or it may be narrow. It may have narrow nostrils or wide ones. But it is a retroussé nose if the profile shows its outline to be concave. So we now know that a pretty nose is a retroussé. 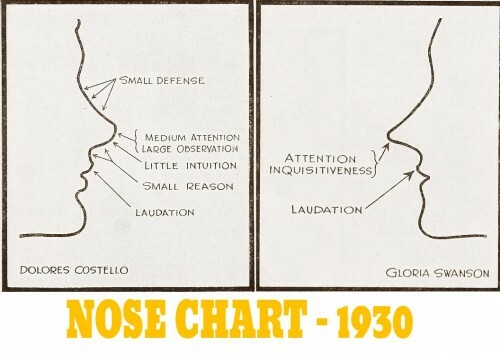 But what else is there to know about your nose ? Aristotle, the first man to associate character traits with features – noticed that there were three places along the bridge of a persons nose that are either prominent, so as to form the arc of a Roman nose, or lacking, so as to produce our concave nose – the retroussé. He referred to them as aggressive, protection, and self defence. 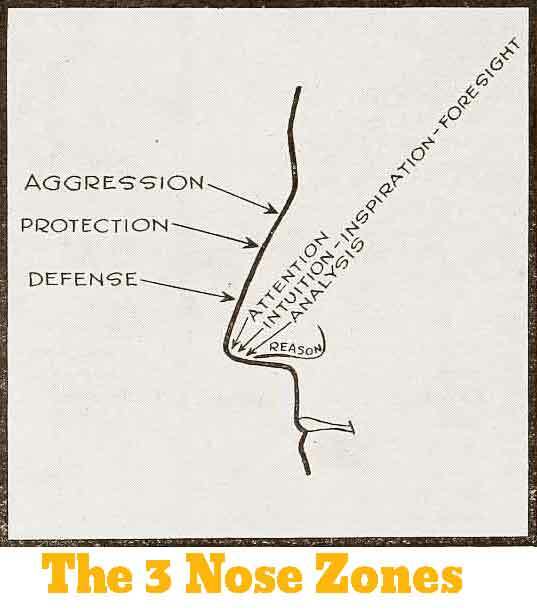 The first zone or ‘bump’ , is the ‘Aggression Bump’. This point determines the practical business like ability of the person. People with no elevation at this point have no business head whatsoever! Retroussés are of the creative type and have no time for money. Gloria Swanson accepted this aspect of herself recently when she handed all her financial affairs over to private management. Lillian Gish could be expected to be as absent minded about her financial affairs as Swanson, if it were not for her nose showing such a pronounced depression at the base – which shows a capacity for deep thought and analysis. Clara Bow, another unwise person when it comes to saving her money, which she scatters with thoughtless generosity on her family and friends, is an improvident retroussé. Joan Crawford, who recently had to downsize with her husband Douglas Fairbanks Jr to a smaller apartment, is most definitely pursued by her retroussé ! On the other hand, look at the lovely Bebe Daniels, with her Roman nose and elevated aggression bump: everything she touches turns to money. Witness the four beach houses she recently built, furnished herself and sold for profit. Mary Pickford. acknowledged throughout Hollywood to be a financial whizz, shows the ‘aggressive bump’ prominently ! The second ‘Protection Bump’ represents a person’s ability to retain mental integrity against all suggestion from outside. Tobe an actress, you don’t want to have this bump at all ! 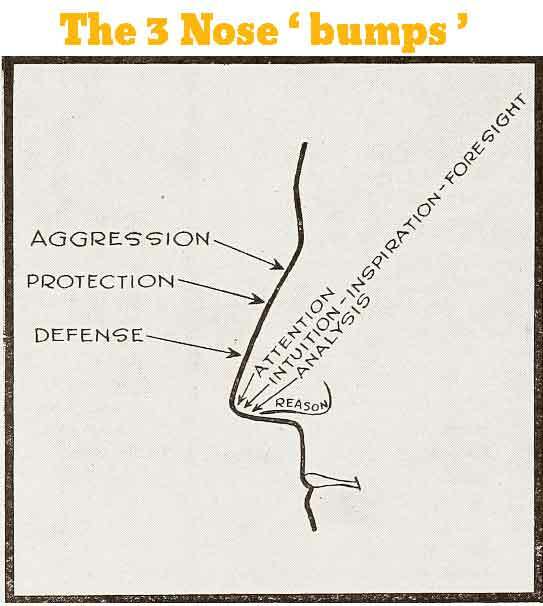 The gift of mimicry is closely allied with this spot of the nose. No actress with a bump here, would get far in her career. She would be impervious to direction. The power to project herself into a character or role is the gift of the retroussé, which lacks the ‘protection bump’. The third of our trio of bumps is named ‘Self Defence’. Many of our most demure actresses lack this bump, and boy does it show in their love life. The most successful and talented of actresses often confound their friends by their utter timidity when under the influence of the string of glib Romeos and poor relations hanging on to their skirts. Verily the retroussé is the actress’s nose ! So the retroussé is a feminine nose. A man with this shape of nose has a more feminine character than otherwise. A large love nature also goes with the retroussé nose.